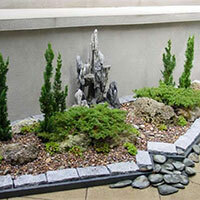 Countless small garden ideas are available for you to take and use in a variety of places around your home. Perhaps you have been looking around for ideas and just haven't come across the right one yet. We've put together an article of some of the most popular small garden ideas, as well as a few that you might not have considered before. Hopefully one of them will light a spark for you! Corner Garden: Gardens have been used to define borders since the beginning of time. Many gardeners and home owners like to convert their yard into a fantasy theme that gives them a sense of being someplace exotic. Gardens accomplish this goal very nicely. The corners of your yard are prime real estate for small garden design ideas because they are most often unused space that you can build into as big or as small as you like. A common concept for corner gardens is to incorporate fencing as a background accent. You can go to any home improvement store and find numerous options for fence sections that you can use. Some people prefer the more traditional split rail fencing, with a single post in the corner, and then angling cross-pieces that slope right into the ground. Such a design will give you a nice corner garden with easily defined sides along the border of your property. If your tastes are more contemporary, vinyl fencing is an extremely popular option these days and lends itself well to most small garden ideas. Aside from having a clean finished look, vinyl fencing is also extremely durable and easy to clean. I personally always lean towards contemporary styles myself, so white vinyl fencing has always grabbed me more over the rustic looking fences. 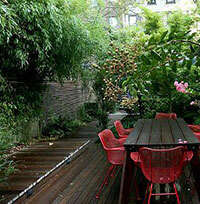 A Sitting Garden: This is one of those garden ideas that quite honestly I find under-utilized in most garden designs. Most gardeners design their flower beds to be admired from a distance, but few actually take the time to build themselves an area where they can escape to when they just need to unwind. For those of you who have never experienced this, you really should. There is something to be said for creating your own little oasis right in your backyard. You don't need a lot of space to create a cozy garden either. 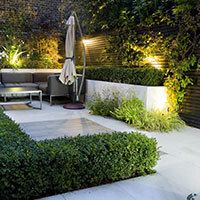 Some of the best small garden design ideas are really the simplest in form and function. At our house we spend a lot of time outdoors but we wanted more than sitting on the deck looking out the back of the yard. We wanted a place where we could escape the day to day hustle and bustle, or at least convince ourselves we had. We accomplished this by taking a corner of our backyard that we really were not using, and planting dozens of bamboo trees, starting heavy in the corner and gradually thinning them along two of the edges. Bamboo trees just have a nice exotic feel to them and they grow well in masses forming a veritable wall with their shoots. Bamboo spreads like weeds however so if you decide to try them in your small garden, make sure you're working with a nice open area. So with that we had one third of the area done. Next we paired the bamboo up with various ornamental grasses, some tall, some squat, and planted them on either side of the bamboo with the tall ones in the back and the short ones in the front. The result was rather stunning with the focus in the back being the exotic looking tall bamboo, then fading into the grasses with the thick foliage. All that was left was to take the last corner and create some sort of an inviting entrance. We achieved this by building a small pergola entrance and placing lilacs and lavender on both sides. We really love the smell of both plants and with the lilacs blooming first in spring, followed up by the lavender over the summer months, they really complement each other well. 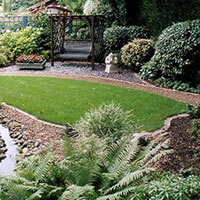 Like many of our other small garden design ideas, we lined the inside of the sitting garden with a stone border to make a defined edge between the grass and the gardens. This also helps keep the area easy to maintain since the center of it is grass. Once the landscaping was completed, all we needed was someplace to sit…it IS a sitting garden after all! We opted to go with an iron and tile table set that has a small fireplace in the center. It's great to go out there in the evenings with a bottle of wine and just relax. As soon as you walk through the pergola it's like walking into another country or some faraway place. The truth is we hate having to leave it as it has become one of our favorite places to spend time now. In our backyard we have a small hill on the one side that leads up to the front of the house. For years we've struggled with what to do with this little stretch of land because it really was not big enough to make a sizeable garden out of, nor was it very functional being a hill. Then one day while I was sitting there staring at it, it came to me… I'm going to turn this hillside into a small waterfall! Now believe it or not this was not one of the more difficult small garden design ideas that I've come up with, but it also wasn't the cheapest either. After a trip to the local garden center for all the water feature equipment, and a trip to the local landscaping supply company to have a pallet of stone delivered, I was well on my way. All the project required was digging out several feet of the hillside straight down to rough out the waterfall, then stacking the stone up to form a wall with a slight tilt backwards. I setup the pond and the waterfall and once I turned it on the water filled the small basin at the top, trickled down the newly formed rock wall, and then emptied into the larger basin at the bottom, only to be pumped back up to the top again. This was one of those small garden ideas that took a few days to build, along with a few hundred dollars, and I gotta say it makes an incredible impression on everyone who sees it. I hope you enjoyed our small garden design ideas and before you go, take a look at some of our other articles for even more garden designs that you can use!